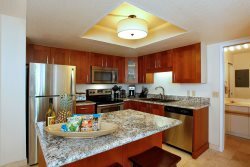 This gorgeous, 3 bedroom/2 bath unit with lovely oceanviews is just across the street from spectacular Kamaole III Beach. Ideally located in the Kamaole Sands resort in sunny South Kihei, adjacent to the upscale Wailea Resort, this affordable beach retreat is a great value for budget-conscious families or friends traveling together. Located in the preferred Building 10, on the lush central courtyard. Close to the beach, but without the road noise. Kamaole Sands boasts 15 acres of tropical gardens with fish ponds, fountains, and waterfalls. FLOORPLAN: To view the floorplan, click on the "Floorplan" link right below the photos, next to the "Start Slide Show" link. 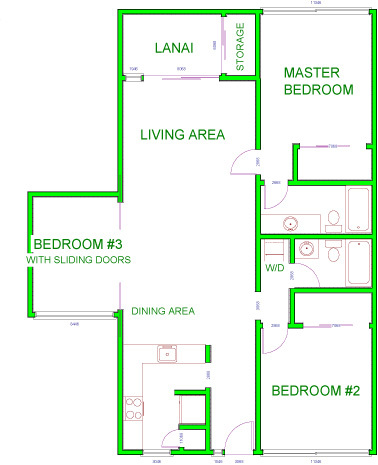 *Please note that this unit has a perfect setup for 2 families (2 couples with up to 4 kids) traveling together, but it does not work well for 3 families (or more than 3 couples) since the Den/3rd bedroom is much smaller and isn't as private as the other 2 bedrooms. *Dedicated parking stall for 1 vehicle only. If you have a second car, a pass can be obtained from the front desk allowing you to park in the Visitor's Parking area- please note that the Visitor's Parking area is on the opposite side of the complex, near the main office. Minivans or large SUVs work great!